Electric Guitar Amp Head All valve, 30 watt, channel switching head. This guitar amplifier sports two dual stage channels with completely separate signal paths. The result is two vintage amps in one. Channel One has a thick, creamy, classic voice that barks like a rottweiler when pushed in to the tone zone. Channel Two has a tighter, springy and slightly faster character with a little more upper mids and a bit more gain. This amp has proved to be so popular worldwide that its specification remains unchanged. It is fast becoming the new world standard for 30 watt Class A valve amplifiers. 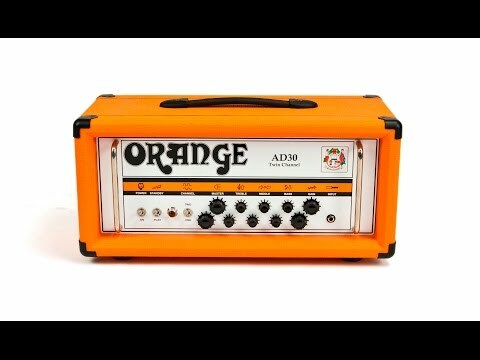 Do you own Orange AD 30 HTC Head or have you had a chance to try it? 2 éve használom, igazi böszme british sound, nagyon jól kijön zenekarban, közép-magas dús, szép a tisztája is nagyon, alkalmas rentgeteg zenére. Je to fajn do skúšobňe aj na pódium. Orange je tutti frutti značka.